WILLIAM TOOTLE was born at Hall Hill in the cotton town of Padiham, just west of Burnley on 23 July 1855 and spent the whole of his life in that area. He was the son of John Tootle, weaver and herbalist, and Mary Hudson. In the 1861 census he is aged 5. He has two older brothers working in a cotton factory, but William is a scholar. His father died in 1866, when William was 10. In the 1871 census, 15-year-old William is living at 25 Croft St, Burnley, with his widowed mother, whose name is given as Mary Tootill, and his older brother Robert. Mary has set herself up as a grocer, while the boys are mule spinners in a cotton mill. Also at the same address are five lodgers. One is a mechanic in a cotton mill, one a vocalist, one an actor and two actresses. The younger actress was 13 years old. Her profession must have seemed very different from William’s. The water-frame spun twist for warps, but it could not be advantageously used for the finer qualities, as thread of great tenuity has not strength to bear the pull of the rollers when winding itself on the bobbins. This defect in the spinning machinery was remedied by the invention of another machine, called the Mule, from its combing the principles of Arkwright’s water-frame and Hargreave’s jenny. Like the former, it has a system of rollers, to reduce the roving; and, like the latter, it has spindles without bobbins to give the twist, and the thread is stretched and spun at the same time by the spindles, after the rollers have ceased to give out the rove. The distinguishing feature of the mule is, that the spindles, instead of being stationary, as in both the other machines, are placed on a moveable carriage, which is wheeled out to the distance of fifty-four or fifty-six inches from the roller-beam, in order to stretch and twist the thread, and wheeled in again to wind it on the spindles. Edward Baines, History of the Cotton Manufacture in Great Britain (1935). William Tootle was living at High Street, Habergham Eaves, at the time of his marriage. His occupation was given as mule-spinner. Habergham Eaves is in the southern part of Burnley. 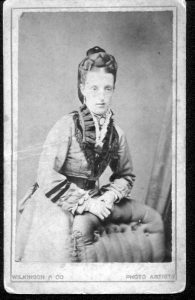 ANN (Annie) REDFERN was the daughter of John Redfern, a carter, and Ruth Chappell. She was born in Wildboarclough, Cheshire and baptised in the Peak District village of Quarnford, Staffordshire, on 10 October 1852. Quarnford is almost on the county border, and Wildboarclough lies 2 miles away in Cheshire. There was an oral tradition that her great-grandson Jack Greaves Priestley’s second name came from a family connection in the Staffs/Cheshire area. But since his paternal grandfather was Robert Greaves Priestley, that is more likely to be the source. She spent her early childhood around the village of Flash, in the township of Quarnford, near Wildboarclough. By the time she was nine the family had moved to Ancoats, Manchester. Her twin sisters were christened there in 1861. Annie had a son William christened in Ancoats in 1871. No father’s name is given. She would have been about 19 then. In the 1871 census 1-year-old William is living with Ann’s parents in Manchester. Ann is not with them. According to an article in the Burnley Express in 1937, Annie came to Burnley when she was 21, around 1873, probably with her parents. She worked for some years as a cotton winder at Messrs’ Whittacker’s Mill. 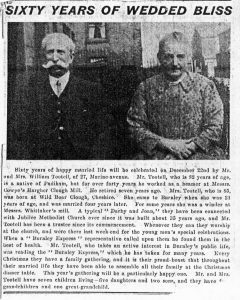 William Tootle and Annie Redfern married at Holy Trinity Church, Habergham Eaves, Burnley, on 22/3 December 1877 by Rev. M. Dorset Owen. The witnesses were Thomas and Alice Smith. At the time of her marriage, Annie was a weaver, living at Padiham Road. She signed with an X.
Annie’s six-year-old child William remained with her parents. They have a grandson William living with them at Habergham Eaves in the 1881 census. At one time, the Redferns owned a grocer’s shop on Howard Street. They were said by their great-granddaughter Edith to be ‘the only part of the family with any money’. In the 1891 census William is a grocer’s assistant. Willliam Tootle worked for more than forty years as a cotton beamer at Thomas Cowpe & Sons, Hargher Clough Mill, Hargher Street, Burnley (owned by Lucas Engineering, it is not an aircraft components factory). Beamers were employed to wind the warp onto the rollers before putting them onto the loom. The beamer would wind the beams with yarns supplied from the creel, while constantly looking over the yarn sheets and stopping the machine in case a yarn broke. He would then have to repair the break, by finding the tail of the yarn, disentangling it if necessary and tying it to the tail of yarn held by the package. He may also have been responsible for the maintenance of the machine. The work was relatively light, but a lot of concentration would be necessary, particularly on a 12 hour shift and in poor light. At the time of their first son’s birth in 1880, their address is given as 17 Hulme Street, Habergham Eaves, Lancashire. The 1881 census has William, aged 25, living with Ann and their son Robert at 24 Pendle Street, Habergham Eaves. Pendle Street was off Cook Street, Padiham Road, a short walk to Hargher Clough Mill. He is a beamer and she is a winder (cotton). Winders were employed to transfer the yarn from bobbins onto cheeses, or into balls, ready for weaving. Ann gives her birthplace as Stockport, Cheshire. There were seven children that we know of, though we learn from the 1911 census that there were two more who died. They do not appear in any of the censuses. The tally appears not to include the son Annie bore before her marriage. Robert, born 17 February 1880. Maria (Ria, pronounced ‘Ryer’). She married Ernest Whittaker. William and Annie lived with them towards the end of their lives. Polly (Mary). She married Frank Howard. Ruth. She married Percy Vurrel. Margaret (Maggie). She died around 1974. Harry. He married Minnie Somerfield. They were later divorced and he married Delia. Minnie. She married Fred Dewhurst. Their only son died in infancy. They went to Calgary in Canada to inherit half an estate with Fred’s brother, but didn’t like it there. They sold their half and returned home, where Fred gambled away all the proceeds. He ended up washing cars for a Burnley garage. William was a great walker. There is a family story that he set off one day to walk to Whalley, some five miles away, and did not appear again until five days later. He had walked all the way through the Trough of Bowland to Lancaster and back, for the sheer delight of it, a distance of more than sixty miles. By 1891, the family had moved to 3 Warwick St in Stonyholme, Burnley. 1891 Census. 3 Warwick St, Stonyholme, Burnley. This time, Annie’s birthplace is correctly given as Wildboarclough. Ten years later, they are at 37 Nairne St, Burnley with their growing family. Annie’s father is now living with them. William was a trustee of the Jubilee Primitive Methodist Church, from its opening on 10 October 1903 until at least the late 1930s. A photo of him in the church half-jubilee brochure (1927) notes that he was ‘seat steward since our church was built’. The first church was on Roebuck Street, where the Riley family also lived. Extracts from “Old Minutes” in the Jubilee brochure. “That we supply the Young Women with paper and pencils to ask questions. “1877 – That we have 50lbs. of nuts to be given away on the field. “1884 – That all scholars in future are requested to obey their teachers, and show respect, or be requested to leave School. In 1851 the population of Burnley stood at 21000. By 1901 it had increased to 97000! Because of this many new houses were built. Burnley was classed as a Cotton Spinning and Weaving Town and by 1902 had 105 firms in the industry. In 1900 approximately 13 Coal mines were open in Burnley with 2400 miners working underground. The other main industry was Iron and Engineering. Poverty was still a problem in 1900. Some families would live in basements and sometimes 2 adults and 4 children would occupy the same bed. A lot of the town’s poverty and crime was blamed on drunknenness and gambling. Sadly Burnley in 1884 had been described as “the most drunken town in England”. There were 309 licensed premises in 1895! Education was not a problem. The 1854 Directory for Mid-Lancashire states “Perhaps no town in Lancashire is better supplied with Public Education Institutions than Burnley, every Church and chapel in the town have either a day school or Sunday School in connection with it”. The 1902 Burnley directory has William Tootle, beamer, at 37 Nairne St. This was in the same block of streets named after Scottish towns as Perth Street, where their son Robert and his family later lived. The family moved frequently in that same area of Burnley. In the 1905 edition, he appears at 5 Gordon St.
Annie’s father, who had been living with them, died towards the end of 1905. Barrett’s 1908 Directory of Burnley has William Tootell living at 5 Howard Street, off Hargher Street right next to the Mill, (later the Lucas aerospace factory). It is just round the corner from Perth Street. They are still at Howard Street for the 1911 Census. Some of the older children have left home. The census adds the information that Ann had been married for 33 years. She had born 9 children alive, of whom 7 were still living and 2 had died. William retired around 1930. William and Annie celebrated their 60th wedding anniversary in December 1937. A report in the Burnley Express has them living at 27 Marine Avenue. In the later years of their life they lived with their daughter Ria and her husband Ernest Whittaker. The 1939 Register shows the Tootles at 130 Florence Avenue, Burnley. They are living with their daughter Ria and her husband. Tootle Ann 12 Sep 52 Unpaid Domestic do. Maggie is another of William and Ann’s daughters. Over the name “Maggie” someone has written in green ink “Margaret”. William is said to have died around 1943 in Burnley, at the age of 87. But in 1944, when Annie died, she was said to be the “wife”, rather than the “widow” of William Tootle. His death registration has not been found. Annie died towards the end of the Second World War. She was still living with her daughter at 130 Florence Ave.
On Jan 28, Ann, beloved wife of William Tootle, aged 91 years. Interred, Burnley Cemetery, Feb 1 from 130, Florence avenue. Enquiries Harold Greenwood. Tel: 3563. She is described as “Wife of William Tootle formerly a Cotton Beamer”. The cause of death was “Senile Myocardial Degeneration.” The death was registered by her son Robert W Tootle who was in attendance at her death. Robert was living at 2 Perth Street, Burnley. Family mythology said they lived to the ages of 99 and 98 respectively, but this was evidently an exaggeration.